Thomas Vanek one-timed a shot from the point and Max Pacioretty shuffled the rebound through the legs of Kristers Gudlevskis. That goal sealed the 4-3 win and four game sweep by the Montreal Canadiens over the Tampa Bay Lightning Tuesday night, the first series to finish in the 2014 Stanley Cup Playoffs. From start to finish, Montreal dominated this series on all fronts. They saw offence from all four lines, received strong defensive play from all skaters and got world class goaltending. In this article, I’m going to look at three players who were instrumental in getting Montreal to the second round. Carey Price continued his career season with four solid games against the Lightning. Starting in overtime of game one, Price brought back memories of the Olympics with calm movement in the crease and good rebound control. In four games he posted a 0.904 save percentage and 2.33 goals against average. Montreal had a big edge in net. With starter Ben Bishop out, Tampa’s goalie Anders Lindback, was far from as good as Price. Besides getting pulled twice, including in game four, Lindback posted a 0.881 save percentage and 3.91 goals against average, both good for 17th in the league. Lindback’s ability to track the puck was far inferior to Price’s and by going down early, he wasn’t able to get across the net as quickly as Price would. Goaltending was always going to be a big factor in this series, but I don’t think anyone predicted it would be this lopsided. The second player I want to highlight is Mike Weaver. His acquisition at the deadline was shadowed by the Vanek trade, but the 35-year-old Weaver is the defensive defenseman Montreal was missing last year against the Ottawa Senators. In this series, Weaver was tied for the team lead with a +5 rating and blocked eight shots. On top of that, Weaver was second only to Brian Gionta in penalty kill time, averaging 1:36 a game. One of Montreal’s strengths is defence by committee, but Weaver was a standout on the back end in this series. The biggest star for the Habs in the first round was Rene Bourque, who was almost reborn in this series. After a terrible season that saw him be a healthy scratch multiple times and only put up nine goals in 63 games, Bourque burst onto the scene this round. In the four games, he had three goals and 22 shots on goal. But it was how he scored the goals that surprised fans. 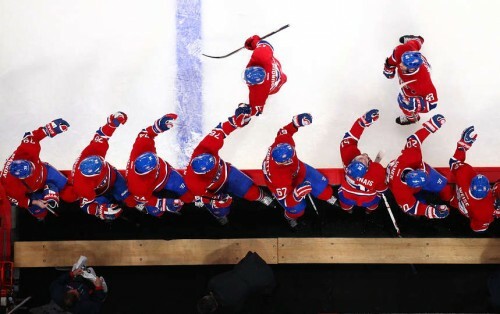 Montreal may have as many as 10 days off before their next game. Since the NHL no longer does reseeding, the team will play the winner of the Boston Bruins and Detroit Red Wings series. Boston is favoured by a lot of experts to win the Cup this year after winning the Presidents Trophy. But if any team can challenge them in the East, it’s Montreal. 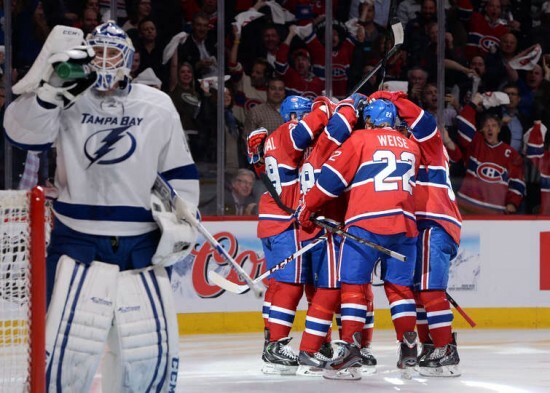 But for now, Montreal just has to rest and be get over their surprise sweep of the Lightning. Michel Therrien summed up this series with one quote in his post-game interview. “In my wildest dreams I didn’t think we would win that series in four,” he said. Nobody did. But by doing so, Montreal instantly becomes a contender. Now they just have to wait for their next opponent.